Herakles Plus Review - A Unique, Well Rounded Vaporizer! Home → Tanks → Sub-Ohm → Herakles Plus Review (2018) – The Most Unique Vape on the Market Today! Herakles Plus Review (2018) – The Most Unique Vape on the Market Today! 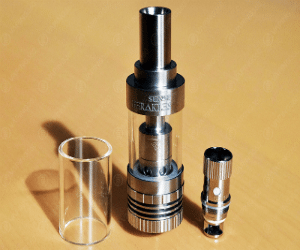 There are a lot of vaporizers to choose from, and while having a wide selection of possible purchases is great, it can often make it difficult to decide why one particular vape is better than everything else that you’ve got access to. While working on this Sense Herakles Plus review, I knew right away that this was a vaporizer that clearly distinguished itself from pretty much every other vape that’s on the market. A lot of this is thanks to the Herakles Plus’s unique airflow system that I haven’t seen on any other vaporizer before this, and while that might not sound like a lot right now, you’ll see just why this is a big deal as I move through the article. The Herakles Plus has been creating for quite a lot of buzz and talk online as of late, and with that being the case, I figured that now would be the perfect time to finally conduct my review of what this vape has to offer. So, without any further delay, here’s my full Herakles Sense Plus Review. One of the big selling points for the Herakles Plus has to do with its top airflow system that’s being used. This system sounds interesting enough on paper, but when put to the test, it works beautifully with the tank to create for truly fantastic flavors and vapor clouds alike. There are plenty of options for sub-ohm vaping as well, and when you add all of this together, it starts to become clear as to why I had such a great time with this review. Airflow that happens at the top of a vape isn’t an entirely new concept, but the way that it is usually implemented creates for some tradeoffs. In most case, t﻿op air﻿flow systems with sub ohm tanks have this mechanism built directly into the drip tips that are present in the vape. This causes extra airflow to not come into contact with the coil, and while it does keep vapor cool, it also affects the taste of your liquid as well - and not in a positive manner. With the airflow system that’s used on the Herakles Plus, the air that’s taken from the top of the unit goes through its own independent chamber at the top of the coil that doesn’t effect your flavor in the slightest. It’s something I haven’t seen before, but after doing an extensive Sense Herakles Plus tank review, I’d definitely like to see this sort of system make its way to other products. Along with my tank review, something else that really caught my eye with this v﻿aporizer has to do with the juice flow controls that are present here as well. These controls allow you to adjust the flow of the juice inside of the Herakles Plus, allowing you to let juice flow at full speed, close it off slightly if you’re using a higher PG type of juice, and shut it off entirely for when you’re refilling the vape. In addition to my extensive tank review, I also thought that it was worth conducting a Herakles Plus coils review. Coils that are used in a vaporizer will either make or break your experience with it, and I’m very happy to report that the Herakles Plus 0.4ohm Kanthal coil that’s used here is absolutely wonderful. The flavors I was able to get out of the Herakles Plus all tasted fantastic. Flavor notes were strong without being overpowering, and I was able to pick up on all of the ingredients that were present in the juice I tried. To go along with this, the Herakles Plus is able to kick out some truly ridiculous clouds. This isn’t all that surprising for a sub ohm tank, but even when used at the 40-50W setting, the Herakles Plus still manages to produce simply massive heaps of vapor - a real plus if you like to show off your cloud-making skills. One of the biggest issues I discovered while conducting my Sense Herakles Plus Tank review has to do with the actual capacity and size of tank that’s being used here. Sense opted for just a 3.5ml tank, and while it should be enough for light to moderate users, it’s definitely going to seem quite a bit small the more you increase your use with the Herakles Plus. The Herakles Plus also has a tendency to eat through juice rather quickly, and this doesn’t really mesh that well with the small tank size. Adding an extra 1.5 or even 1ml of added tank space would have gone a long way to making the Herakles Plus a lot more enjoyable to use, and if you’re someone who tends to vape quite frequently, this is certainly something you’ll want to keep in mind before throwing your money down. Spit-back is something else I encountered along with the small tank capacity, and this is never a pleasant thing to encounter with any vaporizer. I tried using a couple of different coils with the Herakles Plus, and each one produced some level of spit-back. Along with not tasting the greatest, the juice you’re using can get quite hot when using the Herakles Plus at higher wattages - possibly causing for a burned tongue. The spit-back tended to go away after getting through about 1/3 of the bottles I used, but even at that, it’s still a rather annoying aspect you’ll need to put up with. As annoying as the small tank capacity is, something I am glad to have found while conducting my review is the fact that a top fill design is being used here. Refilling the vape with juice is a very simple process, and the top fill nature of it means that it’s always readily accessible no matter what you’re doing. With all of that said and done, where does that put us with my review? There’s no doubt at all that Sense has crafted a really fantastic product here, and there’s quite a lot going for this thing. As annoying as the small tank capacity and frequent spit-back is, there sort of get evened out when you consider the vaporizer’s awesome production of clouds and flavor and excellent top airflow design. If you need a new sub-ohm vape, this is definitely worth a look.